My husband is a very picky eater, but he slurped this soup Maa Sha Allah. He surprised me. It’s very easy to make, and a must for Fall. It’s very filling. Goes well with your favorite garlic bread for a quick lunch, or late night supper. 6) 3 pinches of nutmeg. More if you like. Preheat oven to 400 degrees F. Cut open the squash and remove seeds but keep aside. Cut the squash into quarters. Toss in some extra virgin and arrange on baking sheet and bake in oven until soft. When it has softened, remove from oven and let cool. Peel. In a pot melt the butter and add the squash pieces and sautee for a few minutes. Remove and spoon into blender with the chicken broth [or if you have one of those hand held blenders blend in the pot while adding the chicken broth]. You want it nice and smooth. Place back in the pot, add the nutmeg, chilly powder, salt and pepper and let boil for a 10-15 minutes. In the meantime, toss the seeds with all the seasonings listed above and spread them out on a baking sheet. Bake in a 350 degree F oven, until golden brown. 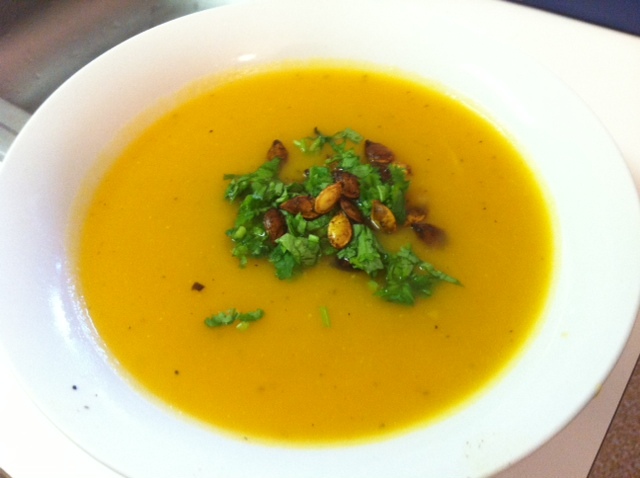 spoon the soup into bowls and garnish with chopped cilantro and roasted seeds. Goes well with garlic bread.